Sixth street used to be named Pecan Street - just a little history for you! I believe most of the number streets downtown at one time had other names. I think they first intended it to be a loop. It is named Mopac Expressway (or, according to some highway signs, Mopac Boulevard) after the Missouri Pacific Railroad (or "MoPac"). If and when Texas 45 is completed to the south of Austin, Loop 1 will effectively serve as a true loop to the west of the city, being directly connected to Texas 45, and indirectly to I-35, at both ends. 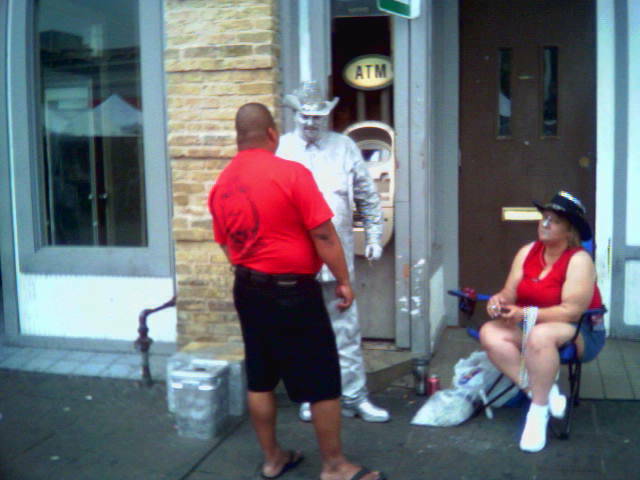 that silver chap looks like some of the street performers i'd see in new orleans. i'm surprised we haven't seen more acts show up on our streets.